Any time is a great time to stitch on needlepoint canvas! Needlepoint stitchers enjoy a variety of canvas sizes, threads, colors and designs when they choose new projects on which to stitch. Needlepoint is counted stitching done on a grid of stiff canvas. Many of our members started their stitching lives using embroidery threads on linen. But it is a natural progression to move on to the art of creating beautiful stitched scenes of infinite variety on needlepoint canvas. If you’ve always wondered what needlepoint entailed, you’ve landed on the best place ever to learn more about it! The Colorado Columbine Chapter of the American Needlepoint Guild is a group in which learning and sharing adds to the pleasure of doing creative needlework. This month, some stitchers took a class to assemble a holiday design incorporating patches of fabric. Others worked on their current favorite projects and caught up with friends. 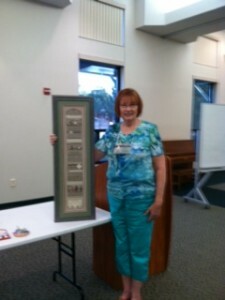 Show and Tell is always a highlight of our meetings as stitchers get to display their finished works for all to see. We see framed pieces, pillows, ornaments, stand-up figures of santas and animals and so on. Stitchers new to needlepoint get all kinds of inspiration from this monthly event. Our members enjoy a day at Denver Art Museum SPUN exhibit! 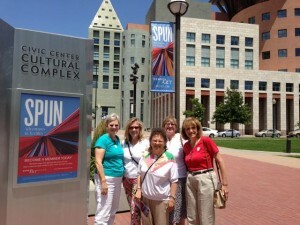 We took a FIELD TRIP this month to the Spun! exhibits at Denver Art Museum. What a pleasurable experience it was to immerse ourselves in threads, stitching, fabrics, clothing, tools and fibers! There was not much needlepoint to view, but glorious fabric displays and a fascinating community project in progress creating a crocheted ‘reef’ of coral. SEPTEMBER 16: Cookie-Cutter Canvas Contest! Each member who would like to do the project should bring a favorite large cookie cutter. It will be traced onto 18-count or 14-count canvas (supplied). Bring your own threads, but look forward to getting some stitch suggestions and design ideas from colleagues. At the November meeting, stitchers will vote on their favorite finished cookie-cutter design. OCTOBER 21: Learn to make an easel to display your finished needlepoint pieces! Display of our work is an important aspect of doing needlepoint. If on display, it can be inspected closely or enjoyed from afar. Not every piece of finished needlepoint needs to be framed for the wall. Learn some new options, starting with this fabric-covered easel from a FanciMats pro. FIELD TRIP! On a date to be determined, Colorado Columbine Chapter of ANG will take a trip downtown to see three tapestries created by our members as a gift to the public. They are on view in the Colorado Convention Center, where thousands of people have enjoyed their beauty over the years. Our members worked hard to create these works of art and new members will enjoy hearing how they came to be. NOVEMBER 18: Our annual holiday dinner and party is once again on the agenda. This time, it falls during the week before Thanksgiving, which may be better timing for the cooks among us. This is a popular event, as our Show and Tell table will no doubt be full of finished works. So, please feel free to drop in to our gathering on any of these dates. Our meetings are short, our threads are long and we are eager to share our love of needlepoint! Members might like to take a peek at our newest advertiser, HERE. Vicki S. shows the group a beautiful stitched sampler recently finished.